LEDUC, Alta. — Quebec’s Robert Desjardins and Isabelle Néron made history on Sunday afternoon in Leduc, Alta. 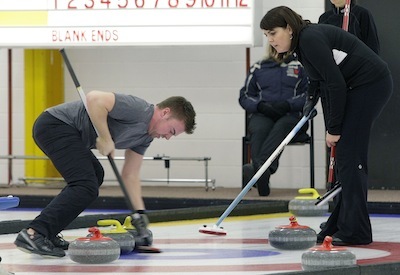 Desjardins and Néron won Canada’s first national mixed doubles curling title, beating Saskatchewan’s Dustin Kalthoff and Nancy Martin 7-3 in the gold-medal game of the Canadian Mixed Doubles Trials at the Leduc Recreation Centre. The Quebec pair went 4-3 in round-robin play and then rattled off four straight playoff victories, including three on championship Sunday. 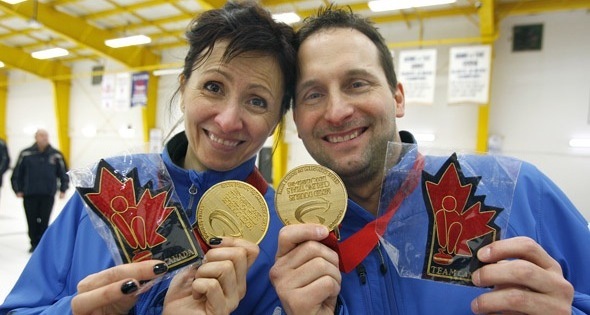 With the victory, the Chicoutimi residents will represent Canada at the 2013 World Mixed Doubles Championship, April 13 to 20 in at the Grant-Harvey Centre in Fredericton, N.B. They were at their clutch best in the gold-medal game. The teams traded singles over the first six ends, but Desjardins and Néron broke the game open in the last two ends thanks to huge shots by Néron. In the seventh, she made a nerve-jangling hit to score the game’s first deuce and take a 5-3 lead into the final end. And in the eighth, Néron made a wonderful double-takeout to leave her team sitting two, both guarded, and producing double fist pumps from her teammate. Martin’s only hope was a last-gasp raise triple takeout that missed the mark, setting off an emotional celebration from Desjardins and Néron. It was an especially sweet victory for Néron, who was returning to the ice this season after spending the past three years battling breast cancer. Desjardins, who played in back-to-back Briers (as a third for François Gagné in 2011 at London, Ont., and then skipping his own team in 2012 at Saskatoon), celebrated his 43rd birthday on Saturday, but didn’t consider Sunday’s victory a late birthday present. “I got my birthday present yesterday,” said a smiling Desjardins, who lost in the provincial men’s semifinal earlier this year. “We were 4-3 (in the round-robin) and (barely) got into the playoffs. You can’t ask for any more. We could have been out at 4-and-3. Today wasn’t a birthday present. Today, we deserved this. Kalthoff and Martin put together a marvellous run to get to the final, but just fell short at the end. It did, however, for Desjardins and Néron, who will begin preparations immediately for their trip to Fredericton to wear Canadian colours at the world championship. Desjardins and Neron shaded Nova Scotia’s Mark Dacey and Heather Smith-Dacey 7-6 in one semifinal, while Kalthoff and Martin advanced to the gold-medal game with a 7-4 win over Saskatchewan’s Dean Hicke and Chantelle Eberle. Hicke/Eberle and Dacey/Smith-Dacey went home with bronze medals. Canada has been previously represented at the World Mixed Doubles by two members of the winning team at the Canadian Mixed Curling Championship. In 2008 at Vierumäki, Finland, Canada (Susan O’Connor and Dean Ross) finished fifth while in 2009, Canada earned a bronze medal — the only podium finish by a Canadian team — with a third-place finish by Sean Grassie and Allison Nimik. In 2010 at Chelyabinsk, Russia, Canada did not compete because the Icelandic volcanic ash caused the temporary cancellation of air travel which prevented Dacey and Smith-Dacey from arriving in time for the competition. Canada’s Rebecca Jean MacDonald and Robert Campbell finished 12th in 2011 in St. Paul, Minn., while last season, Eberle and Hicke were sixth in Erzurum, Turkey. For more information on the 2013 World Mixed Doubles Championship, go to: www.wmdcc2013.curlingevents.com/.